To handle these thundering herds, stockyard were established next to the railroad shops. In 1866 alone, the Missouri Pacific and MKT Railroad Stockyards handled an estimated 168,000 head of longhorn cattle. A cattle drive of 100 years ago, was a hard way for a cowhand to earn $100. The days were hot and dusty, the nights cold and lonely. It was an unglamorous job but cowboys left a trail of glamor. Such was the life of Gil Favor, Rowdy Yates and the rest of the Rawhide drovers as they headed for Sedalia in the popular 1960’s television show: Rawhide. The show, based on the diary of Drover George C. Duffield,depicts the hardships of the 1866 cattle drive from San Antonio to Sedalia. The series first aired on January 9, 1959 with the “Incident of the Tumbleweed”. Almost seven years and 217 shows later, the series end-ed on December 7, 1965 with the “Crossing at White Feather”. Lyrics to "The Rawhide Theme"
Just rope ‘em, throw, and brand ‘em. Soon we’ll be livin’ high and wide. at the end of my ride. Move ‘em on, head ‘em up, Rawhide! Cut ‘em out, ride ‘em in, Rawhide! Hell bent for leather, Wishin’ my gal was by my side. This excerpt was taken from The Trampling Herd: The Story of the Cattle Range in America, by Paul L. Wellman et.al. George C Duffield, who made the drive of 1866, was a young man from Iowa. He owns one great distinction among the trail riders - he alone of all of them kept a diary. 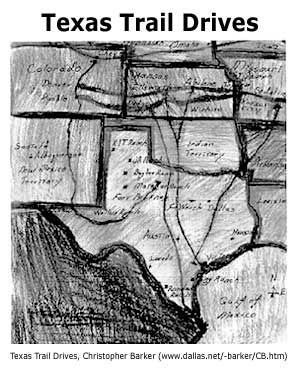 The document, published in the Annals of Iowa in 1924, gives illumi-nating and intensely human view of the difficulties of the trail. With Harvey Ray, his partner, Duffield went down the Mississippi by steamboat, and to Galveston by coasting steamer, then overland to the Colorado River country where they bought cheap cattle and made up a herd to be returned to Iowa. It was April 29, 1866, that the northward march began. But when he reached the Brazos the real trouble began. His approximately one thousand cattle were divided into three herds, with twenty cowboys as trailers, and it took three days to make the crossing. Cattle and horses were swum across and provisions and camp equipment were ‘rafted’ over. Unfortunately most of the ‘Kitchen furniture such as camp Kittles Coffee Pots Cups Plates &c &c” were lost in the process. After rounding up the cattle on the other side of the river, ‘all Hands gave the Brazos one good harty dam,’ and rode away without joy. Eventually, however, the cattle were crossed and the herd reached the vicinity of Baxter Springs July 10 with no further losses. There Duffield found the cap and climax to his woes - the grangers and Jayhawkers were in charge of the border and the cattle could not pass through Missouri. It was a wise decision. Swinging his herd to the west he passed around the settlements north to the Nebraska line. One cannot but sympathize with the young trail driver in his woes and even after the passage of sixty years there is joy in know-ing that at last he came to the end of the sorrowful road. Early in September, the ancient journal records, he reached the Missouri River near Nebraska City and ferried his few hundred remaining cattle over into the promised land of Iowa. There is an expression still current in the American language; “In spite of Hell and high water.” It is a legacy of the cattle trail, when the cowboys drove their horn-spiked masses of longhorns through high water at every river and continuous hell between, in their unalterable determination to reach the end of the trail which was their goal. Spanish ranchers brought the first permanent herds of cattle to America more than three hundred years ago. Without fences to control their movement, these hardy animals grew wild and mixed freely on the open prairies. These cattle had long legs, lanky bodies, with legs and feet built for speed. It took a good horse with a good rider to outrun a Texas Longhorn. A century or so of running wild had made the longhorns tough and hardy enough to withstand blizzards, droughts, dust storms, attacks by other animals and indians. They did not require great amounts of water to survive. Over time, they also developed long horns and grew an independent, often fierce nature. Some of their descendants still roam the western range. By the late 1860’s it is estimated that more than a million head of cattle grazed the Texas plains. The men and boys who kept the cattle together and ‘drove’ them up the trail to market were called ‘’drovers’. Each day the herd traveled 10 to 15 miles. The ‘trail boss’ searched for places where the cattle could ‘graze’ and be watered. It was common to have only 6 to 10 men driving as many as 1,500 head of cattle 500 to 1000 miles. River crossings, storms, and stampedes were just a few of the dangers cowboys faced on the trail drive. Younger men traditionally drove the cattle, a chore more exhausting and dangerous than glamorous. 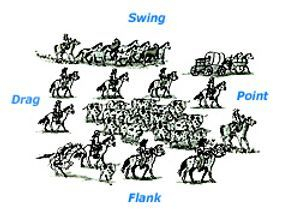 When handling a herd, some cowboys rode ‘point’ or near the front, with others along the sides, ‘swing’ and ‘flank’. Those in the rear or ‘drag’, kept the stragglers with the heard, always riding in a cloud of dust. The trail boss rode ahead to scout the trail and choose a place to camp. On horse back, a cowboy felt taller, faster and stronger. With the aid of his horse he could round up the cattle, cut them out for branding and drive them to market. Extra cowhands were hired for the massive roundup. After morning chuck, the cowhands would fan out, drive the ornery critters out of ravines and bottom lands, and circle back toward the chuck wagon’s afternoon destination. They then would sort out the owners stock, doctor the sick, castrate and brand the new calves. Armed with a hot branding iron, cowboys marked livestock as they have for over 4,000 years. Some might have so many brands, marks and notches they would look like a walking billboard. The cowboys equipment included: low waisted pants; neckerchief; firearm, chaps, bit and bridle, lariat, spurs, knife, boots, gloves, hat and their single most cherished possession, a saddle.